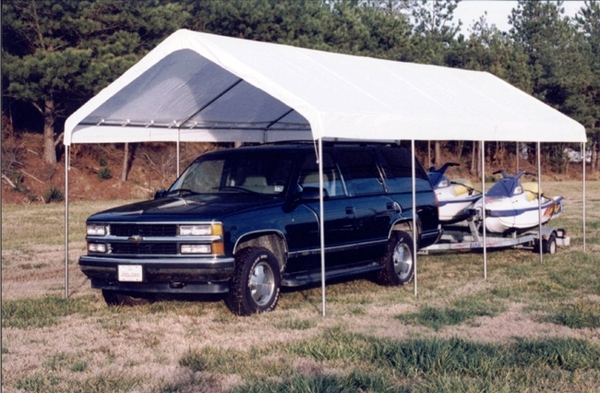 It's hard to beat this King Canopy 10 x 27 Universal Portable Garage Canopy Shelter for versatility. It's also hard to beat it for affordability - especially when you consider its cost against constructing a freestanding garage or adding one to your home. Check out some of the specifications below to find out just how functional and affordable this product can be. That stability is added to by the 10-leg design of the frame, which adds several points of contact to the ground so your shelter has the best footing possible. The white waterproof polyester cover protects you, your friends, or your equipment from debris and rain, plus you get drawstrings or curtain flaps should you choose to add sidewalls (which must be purchased separately) down the road. This is one case where you can sort of have your cake and eat it, too. You can get great protection from the elements, you can put it where you want to, and it won't break your outdoor budget for the next two decades. The King Canopy 10 x 27 Universal Portable Garage Canopy Shelter is a convenient shelter that gives you quick, affordable storage you can count on for years and years. Does this model come in an 11 foot size, so I can cover my RV trailer? This item is not available in the size you require. Please visit our RV & Camper Shelters for an item that may fit your needs.